Training for the Managers/ Social Workers/ Teachers/ community people etc. 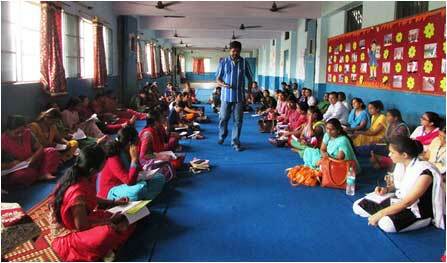 A Staff Capacity Training Programme was conducted on “Sustainable Development” at ADF, Shahid Nagar, Ghaziabad. The aim of the training was to make staff of ADF understand fully the concept of sustainability and how to make the projects of ADF sustainable. It was a three days training programme A total of 60 ADF staff members participated in the training. Resource persons were Fr. Susai Sebastian, President, ADF, Rev.H.K.Chetty, Director, ADF and Mrs. Jothi Chetty, Secretary & Chief Executive, ADF. The topics covered under the training programme were i) Sustainability- Origin of Sustainability, Sustainability in India, Case Studies and ii) Projects of ADF and how to design a sustainable project. On the 1st day of the training the participants were given orientation on Sustainable Development. On the 2nd day, the participants worked on how to make their projects sustainable. On the 3rd day of the training, the participants gave feedback on what they have learnt and understood on Sustainable Development. Many success stories of Sustainable Development were shared during the three days training programme.